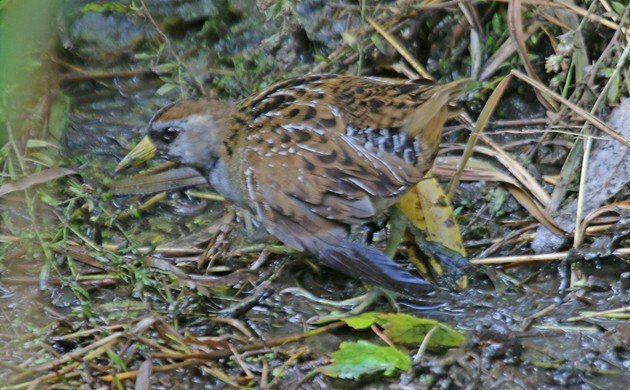 When a Sora was found in the Loch in New York City’s Central Park almost a week ago birders were pretty happy. After all, a twitchable Sora in Manhattan is an oddity with the only previous really twitchable bird being the one that showed up in Bryant Park two years ago. But exhilaration turned, to some degree, to dismay, when it was realized that this Sora had a broken left wing, as you can see in the above image. In order to migrate the bird will need to fly. This bird can not fly and therefore can not migrate. And while a Sora in winter in New York State is not unprecedented, such occurrences are few and far between, mostly because their preferred wetland habitats freeze over in all but the mildest winters. Discussion about trying to catch the bird and get it to a rehabilitator has started on the local listserv but the bird’s apparent health and vigor (other than its broken wing) has made the point kind of moot at this point. After all, you can’t rehabilitate a bird if you can’t catch it! But if the bird is left to its own devices it seems likely that the wing, which might be beyond repair already, might get worse. And once winter comes, this bird is likely doomed unless we get an amazingly mild season. So, what do you do with a Sora that is seriously injured? For now, birders have mostly been looking at and taking pictures of it. That’s what I did on Sunday afternoon. What do you think should be done? He is in pain and suffering and will die an unpleasant death unless somebody gets a net or a sheet and catches him, which won’t be all that difficult. Take him to Ritamary McMahon at the Wild Bird Fund, 565 Columbus Avenue, and she will take him to her vet. At least alert her to where he is. Or, the Sora could suffer an die an unpleasant death from the stress of capture, which, if you’re familiar with the species (or rails in general), will certainly be “all that difficult.” Rita McMahon was already informed and echoed those same sentiments. Nature is cruel. No matter what, animals ususally suffer a horrible death from whatever cause. From an objevctive viewpoint it is absurd to even try to intervene unless it is known that the bird’s injury was caused by human activity. Otherwise, respect nature enough to let it take its own course. What is the State Bird of Hawaii? Where Are You Birding This First Weekend of October 2009?